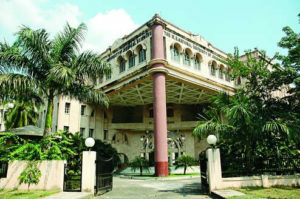 NUJS was established in 1999 by the Bar Council of India, in conjunction with the government of West Bengal. The Founder-Vice Chancellor was Professor N.R. Madhava Menon, a former Professor of law of Delhi University and Founder-Director, National Law School of India University(NLSIU), Bangalore, who is credited with revolutionizing the field of legal education in India, by starting the concept of “national law schools”, as opposed to the traditional law colleges prevalent before. The NUJS, Kolkata, along with the GNLU and NLSIU, Bengaluru, remain the only three national law schools which have the honourable Chief Justice of India as the Chancellor. This set-up provides an aura of exclusivity and rare stature to these National Law Schools in India. It may be noted that all other National Law Schools have the Chief Justice of the respective state High Courts as their Chancellors. Other eminent personalities without whose help and active intervention the university could not have been founded, include Jyoti Basu, a former Chief Minister of West Bengal who was a Middle Temple barrister; Sh. Somnath Chatterjee, a former Speaker of the Lok Sabha, also a Middle Temple barrister and a leading member of the Calcutta Bar Library; and Justice Chittotosh Mookerjee, a former Chief Justice of the Calcutta High Court and the Bombay High Court and the (Acting) Governor of Maharashtra. Justice Mookerjee was the university’s Honorary Treasurer and has been associated with the work of the university since its inception in 1999. The NUJS is an autonomous university. Initially, classes, which started in 2000, were held at Aranya Bhavan, where the Environment Ministry of the government of West Bengal is located, and the first batches of students started living in government flats. On 28 October 2002, the university’s present-day permanent campus was inaugurated by the then Chief Justice of India, B. N. Kirpal. In 2006, NUJS was allotted a 50-acre (200,000 m2) plot in Rajarhat, an upscale township, which is being developed by the West Bengal government. NUJS was ranked third by India Today‘s “India’s Best Colleges 2017: Law”, second in India by Outlook India‘s “Top 25 Law Colleges In 2017” and fourth in India by The Week‘s “Top Law Colleges 2017”. A large number of graduates of NUJS have been recruited by premier law firms of India and abroad by way of a student run campus recruitment process. Recruitment for the batch graduating in 2008 marked the advent of international law firms including Magic Circle firms who have picked up students for Training Contracts at Allen & Overy, LLP, Clifford Chance, LLP, Freshfields Bruckhaus Deringer, LLP, Linklaters, Herbert Smith, LLP among others. The domestic law firms which have recruited students from NUJS include Luthra & Luthra Law Offices, Khaitan & Co, Amarchand Mangaldas, AZB & Partners, Trilegal, and many others. Many alumni are currently employed by leading global law firms across jurisdictions spanning the US, the UK and Singapore. Over the years, alumni have also acquired the necessary qualifications to enable them to practice as lawyers in these major jurisdictions. Among companies, ITC, Mc Kinsey, ICICI Bank, Reliance Infocomm, Tata Sons, Infosys and many more have recruited from campus. SEBI the capital markets regulator in India has also recruited students from NUJS. Some graduates pursue careers in litigation by joining the chambers of Senior Advocates in the Supreme Court of India or High Courts & Trial Courts. Many graduates enter the litigation space after gaining some work experience in the corporate sector, which adds to their skill-set as lawyers. Law teaching: Some graduates have also embarked on a career in law teaching. NUJS graduates have been recruited by the School of Law,Singapore Management University, NLS and NUJS itself as assistant professors and lecturers. Careers in policy analysis and governance: A new breed of graduate lawyers have begun to venture into the domain of policy think-tanks and governance. In India, the alumni are strewn across major research and policy bodies that include the PRS Legislative in New Delhi, the Centre for Policy Research, New Delhi, the Hindu Policy Centre, Chennai and so forth. Students have also ventured into marrying media and journalism with their core expertise in the law. Alumni have studied specialised media and journalism courses in leading schools, such as the Asian College of Journalism in India and at leading colleges and universities abroad, such as the Columbia University, USA. Higher education and scholarships: Some graduates prefer not to sit for the recruitment process. Instead, they decide to pursue higher education at some of the premier universities in the country and abroad. Graduates have received many prestigious scholarships at premier universities abroad, including the Felix Scholarship to Oxford University, the Vanderbilt Scholarship (NYU, most recent being one offered to a student in 2014), Shell Centenary Scholarship (Oxford), the J.N. Tata Endowment Scholarship, the Chevening scholarship and the Rhodes scholarship. NUJS students have won the Rhodes Scholarship in 2006 (Shibani Ghosh) and 2013 (Amba Kak). Other notable recent achievements include securing the Commonwealth Scholarship in 2012 for pursuing higher studies in the UK. Many students have also collected the INLAKS scholarship on a regular basis over the years. Students of NUJS have walked the corridors of leading law schools across the globe. Most notable among them are the Harvard University and other Ivy League universities in the US, the Oxford and Cambridge Universities in the UK and a host of reputed institutes, including the IIMs in India. Fellowships: Students of NUJS have recently made their presence felt in the field of prestigious fellowships such as the Google Policy Fellowship in 2012. The Google Policy Fellowship was the first to be won by any Indian law student. Other recipients of this fellowship have been students of the IITs and the IIMs. Students have secured fellowships from a host of other reputed organisations such as the Cape Town-based international NGO, Natural Justice in 2013, the Young India Fellowship and the LAMP Fellowship offered by New Delhi-based PRS Legislative Research. Recent success in the UPSC exam : In 2012, 6 alumni (2 from the year’s graduating batch in 2013) were selected for the prestigious Union Public Services Commission Exam, receiving entry into the elite services, viz., the IAS(1), IRS (1), IFS(2) and the IPS (2). Most notably, three students ranked in the Top 100 of the coveted list of successful candidates. In 2013, the students continued their winning streak with 2 selections. Many alumni and students have been taking an increasing interest in this field off late.